You know it's almost Easter by the appearance of Cadbury Creme eggs - the classic chocolate candy filled with ooey gooey marshmallow-y goodness colored to look like egg yolks. 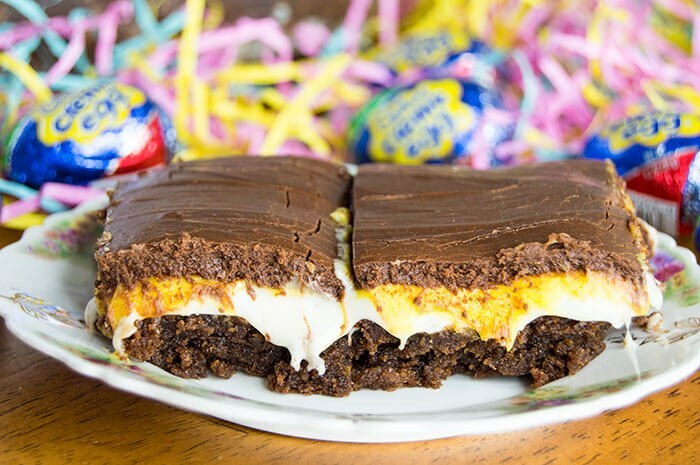 It's standard practice in our family to find these little chocolate eggs in our Easter baskets, but this year, I decided to take Cadbury creme eggs to a whole new level: Cadbury creme egg brownies. 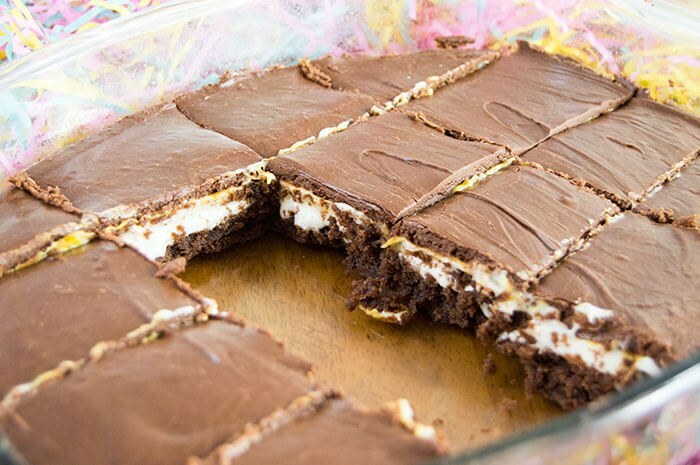 Made with layers of brownies, creamy marshmallow and chocolate fudge, even the Easter bunny will want a bite of these brownies! Luckily this year, I found an oval shaped glass pan - which I figured was close enough to the shape of an egg to call this a "giant Cadbury creme egg." Once you cut into the brownies, the filling oozes out, just like the real deal! With their chocolately brownie bottom and fudgy top, they taste pretty close to the original too. Preheat the oven to 350°F / 175°C. Prepare the brownies according to the package. Bake for 20-25 minutes (or as recommended on packaging). Cool completely. Reserve half of the creme in a small bowl. Stir in the yellow food coloring. Spread the white creme across the top of the brownies in an even layer. Repeat with the yellow cream. Chill for at least one hour. In another bowl, add the tub of chocolate icing along with the chocolate chips. Microwave for about one minute then stir together until the chocolate chips are melted and smooth. Pour the chocolate mixture over the top of the creme layers. Refrigerate at least eight hours or overnight. While the brownies are still chilled, cut into even sized squares. Serve cold or room temperature for a more authentic "creme egg effect." Enjoy!